Founded in 1982, the Münchner Klaviertrio (Munich Piano Trio) is one of the most active and sought-after German chamber music ensembles. The musicians have undertaken lengthy concert tours throughout Europe, North America, Russia, Japan, China and a few African countries. The Trio has given concerts in the world’s most famous venues, including Berlin’s Philharmonic Chamber Music Hall, New York’s Carnegie Recital Hall, Munich’s Cuvilliés Theater, Hercules Hall and Prince Regent’s Theater, Tokyo’s Suntory and Casals Hall and London’s Wigmore Hall. Festival engagements have included the Munich Opera Festival, the Orlando Festival and the European Chamber Music Festival in Strasbourg. Collaborative performances with renowned German critic and author Joachim Kaiser also play a major role in the Trio’s concert activity. 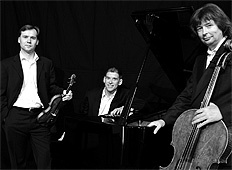 The Münchner Klaviertrio has become a welcome guest worldwide with its exceptional programming. Repertoire includes the masterpieces of the trio literature, as well as less frequently performed Romantic and modern works, including new compositions written especially for the ensemble. Fono Forum praises the “precision and homogeneity of its ensemble,” and the Süddeutsche Zeitung admires the Trio’s “well balanced agogic, fervent depiction of the musical lines, refreshingly lively phrasing” as well as its “outstanding, harmonious blending of accompanied and solo passages.” Global master classes, frequent performances on radio and television, and more than 40 CDs round off the activities of the Münchner Klaviertrio.